Shade solutions are incredibly popular with many business owners in Australia, especially with restaurant and café owners. I’m sure you’ve noticed restaurant awnings in place outside many cafes and restaurants yourself. If you’re the owner of a restaurant or café, you should also consider investing in one. But why are restaurant awnings so popular? I’m here to answer this question. As a shade solution supplier, I’ve met numerous customers who look for awnings for their business location. Over the years, I have learnt just why so many business owners seek them. Today, I’ll explain to you the reasons behind this. So, continue reading this article as I list 3 benefits offered by restaurant awnings. Hopefully, after you read through, you’ll consider investing in one yourself. Many business owners invest in restaurant awnings so they can offer all-weather dining for customers. Indeed, by simply installing an awning outside your restaurant or café, you can create a wonderful outdoor dining area where customers can dine, come rain, sun or hail. If you’d like to install awnings outside your café or restaurant, make sure to go for high quality products, such as those we offer at Global Shade. Our awnings are manufactured using shade fabrics of the highest quality. As a result of this, they are weather-proof and are resistant to wear and tear. By choosing our awnings, you’ll have a quality shade solution that will offer you many years of service. Another reason why business owners install restaurant awnings is to increase the curb appeal of their restaurant or café. Awnings are a simple and cost-effective solution to creating an enticing patio area. By installing one, you will be able to attract more customers and increase your sales. At Global Shade, we can customise awnings to reflect your personal preferences and branding requirements. We offer our shade solutions in a range of designer colours and you can customise our products to reflect your branding colour scheme. Furthermore, we can even incorporate your business logo onto our shade products. When you choose our high-quality awnings, not only will you increase curb appeal, but you’ll also be able to advertise your business. While restaurant awnings work great in increasing curb appeal and creating an outdoor dining area, their number one benefit is that they offer exceptional UVR protection. High quality awnings, such as those we offer here at Global Shade are capable of blocking out up to 99% of the sun’s UV rays. By installing one of our awnings in your patio, you can protect your customers from the sun’s harsh UV rays. Our awnings will help you create a cool and protected shaded area, which your customers are sure to appreciate. 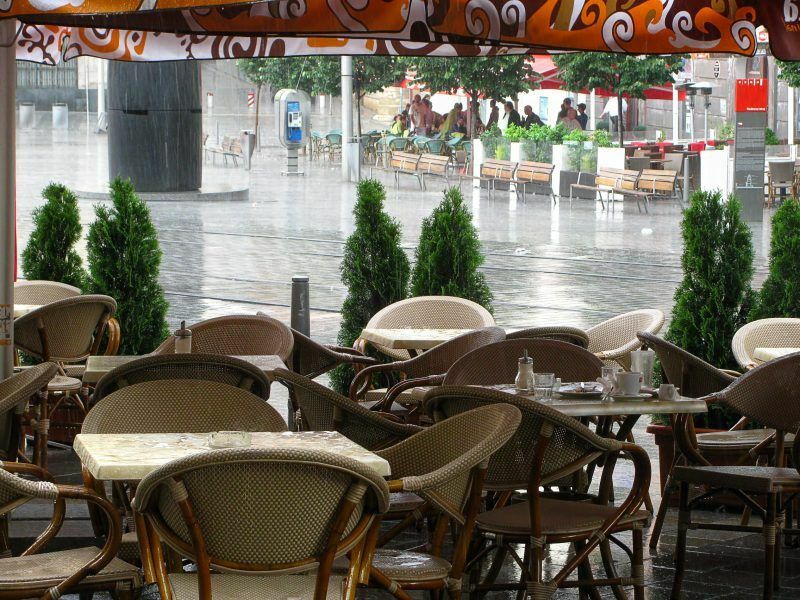 If you own a restaurant or a café, you should definitely consider investing in restaurant awnings. They will help you create an all-weather dining space outdoors, they’ll enhance your curb appeal and they’ll also protect your customers from UV rays. Restaurant awnings are a simple, yet effective way of attracting more customers and making more money. So, make sure to invest in one. For the best quality restaurant awnings in Australia, look nowhere else but Global Shade. We offer superior grade awnings that are sure to offer you all the benefits I have listed above. So, get in touch with us to place an order for an awning. Give us a call at 1800 724 407 and we’ll be happy to discuss your requirements. Call us today!